Normal testes. Transverse color Doppler images of both testes demonstrate symmetric echogenicity and flow. Normal testis and epididymis. 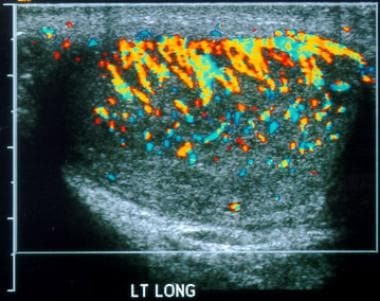 Longitudinal color Doppler image shows diffuse, normal flow to the testis and epididymis. Testicular torsion. Longitudinal color Doppler image demonstrates no flow to the testicle and enlargement of the epididymis and spermatic cord, which are avascular as well. Testicular torsion. 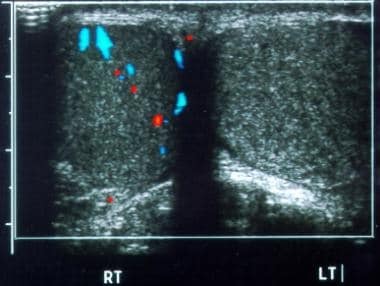 Longitudinal color Doppler image of the left testicle without evident flow. Testicular torsion. 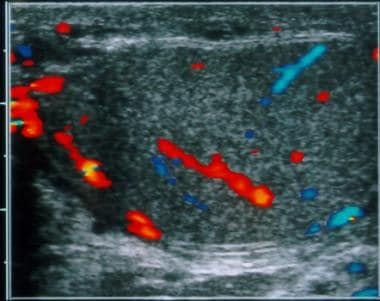 Transverse color Doppler image of both testes demonstrates enlargement, slightly decreased echogenicity, and absent flow on the left side. In general, laboratory tests are not diagnostically useful in distinguishing torsion from other acute scrotal syndromes. Urinalysis results are negative in 98%, and a mild leukocytosis may occur in as many as 30% of patients. Prior to the development of high resolution, real-time ultrasonography coupled with sensitive color Doppler, nuclear scintigraphy was the mainstay of tests available to evaluate the acute scrotum. Given associated radiation, less widespread availability, limited ancillary information, and the accuracy of color Doppler imaging, scrotal scintigraphy is no longer used as frequently. [12, 13, 14] In cases with a clinically ambiguous picture or with indeterminate sonographic findings, scintigraphy remains a viable imaging alternative. Testicular scintigraphy is straightforward, although it requires intravenous access. An infiltrated radionuclide bolus prevents an adequate examination. False-negative results are unusual. False-positive results are more frequent because of the changing scintigraphic appearance of infarction over time and potential interpretation errors. Information about the role of MRI in the diagnosis of torsion is limited, although MRI is likely to be highly sensitive. [17, 18] However, with its limited availability, particularly at night, and its cost, MRI is unlikely to become a front-line examination for the patient presenting with acute scrotal pain. For excellent patient education resources, visit eMedicineHealth's Men's Health Center. Also, see eMedicineHealth's patient education article Testicular Pain. Limited information is available on the potential role of magnetic resonance imaging (MRI) in the diagnosis of acute testicular torsion. Findings from small studies to date suggest a high degree of accuracy with MRI, particularly when it is performed with contrast enhancement. These finding are corroborated by results of controlled animal models. In addition, phosphorus-31 magnetic resonance spectroscopy can demonstrate rapidly decreasing levels of adenosine triphosphate (ATP) associated with ischemia. To our knowledge, no adequate, controlled clinical trials have been performed to assess the degree of confidence with MRI as a diagnostic tool for testicular torsion. However, if the torsion knot or whirlpool patterns are recognized in conjunction with testicular enlargement and absent vascularity, the diagnosis is virtually certain. On normal gray-scale and color Doppler images, the testes are homogeneous and symmetrical in echotexture, as shown on straddle views. The testes are relatively symmetrical in size, but the normal range varies widely. Testicular torsion. Epididymitis. 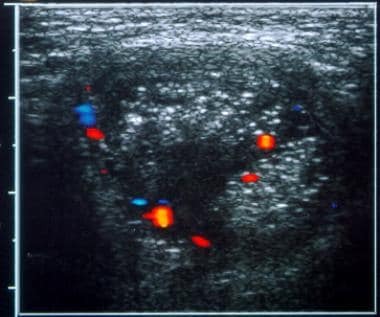 Longitudinal color Doppler image depicts normal vascularity of the right testicle, with increased flow in the epididymal tail and a small hydrocele. Testicular torsion. Epididymo-orchitis. Longitudinal color Doppler image of the left testis shows diffuse, markedly increased vascularity. Testicular torsion. Epididymo-orchitis. 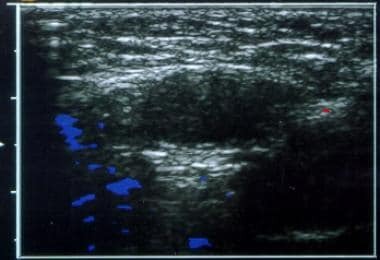 Transverse color Doppler image demonstrates increased epididymal flow and a hydrocele. Testicular torsion. Scrotal hernia. 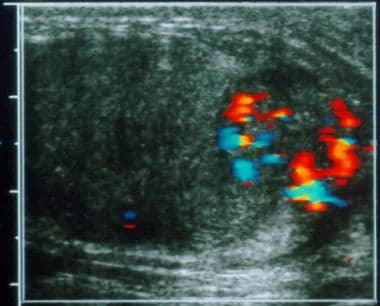 Transverse color Doppler image of the left hemiscrotum shows heterogeneous mass superior to the testicle, with small vessels depicted. Testicular torsion. Scrotal trauma. 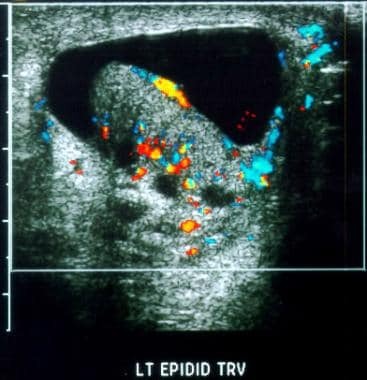 Transverse color Doppler image demonstrates an enlarged, non-hypervascular epididymis (EPID) adjacent to the upper testicle (TEST). Testicular torsion. Testicular tumor. 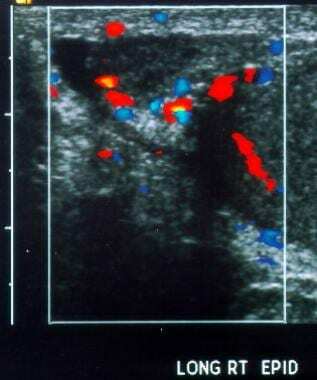 Transverse color Doppler image displays a hypervascular mass in the periphery of the testis. Color and/or power Doppler imaging should be performed in all cases. Flow to the affected testicle is absent, although normal or increased flow may be seen with spontaneous detorsion. The symptomatic side should be compared with the asymptomatic side by using the straddle view obtained with optimal technical settings. Epididymitis is visualized as an enlarged, hyperemic epididymis, usually with a diffusely affected area. [19, 20] Involvement of the testis also produces enlargement and increased vascularity. A scrotal abscess, whether intratesticular or extratesticular, is typically seen as a complex fluid collection, often with a vascular capsule. Torsion of the epididymal appendage is easily recognized as a mass adjacent to the epididymal head without flow; this mass does not affect the testicular vasculature. Finally, an intratesticular hematoma may mimic a necrotic testis, but it typically has normal surrounding blood flow. 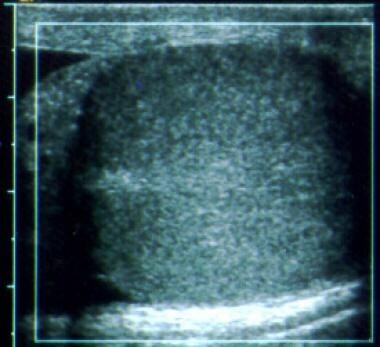 An extratesticular hematoma appears as a complex, cystic collection clearly separate from but possibly displacing the testis. An absence of flow in a symptomatic, enlarged testicle, with flow demonstrated in the contralateral testicle, is highly specific. Power Doppler and color Doppler imaging should be used together in prepubertal boys, but it demonstrates flow in only 79-90% of normal cases. [21, 22, 23] Color Doppler and power Doppler sonography both demonstrate flow in almost 100% of postpubertal patients. Color Doppler and power Doppler imaging have similar sensitivities for demonstrating flow in small testes, although the combination of the 2 techniques has a sensitivity that exceeds the sensitivity of each alone. Overall, the specificity is 77-100%, and the sensitivity is 86-100%. Posttorsion hyperemia may be confused with epididymo-orchitis, producing a false-negative finding. Capsular blood flow must be distinguished from intratesticular arterial flow; these observations may produce false-negative results. Although flow may be visible in one testis and is usually evident in the other, false-positive findings are possible in the young child. Technical factors (eg, erroneous flow settings, motion artifacts on power Doppler images) may produce false-positive or false-negative results. Technetium-99m pertechnetate is the agent of choice, with an adult dose of 10-20 mCi and a pediatric dose of at least 5 mCi. Typically, immediate radionuclide angiograms are obtained, with subsequent static images as well. In the healthy patient, images show symmetric flow to the testes, and delayed images show uniformly symmetric activity. The appearance of testicular torsion on scintigraphy depends upon the chronicity. In acute torsion (usually < 7 h), blood flow may range from normal to absent on the involved side, and a nubbin sign may be visible. The nubbin sign is a focal medial projection from the iliac artery representing reactive increased flow in the spermatic cord vessels terminating at the site of torsion. (This sign can also be seen in later stages.) Static images demonstrate a photopenic area in the involved testis. In the subacute and late phases of torsion (missed torsion), there is often increased flow to the affected hemiscrotum via the pudendal artery with a photopenic testis and a rim of surrounding increased activity on static images. This has been called a rim, doughnut, or bull's-eye sign. Acute epididymitis generally appears as an area of focal or diffuse increased activity in the involved hemiscrotum. Testicular appendix torsion has a variable appearance: it may have a normal scan or a focal area of increased or decreased activity. An abscess, tumor, or hematoma may be indistinguishable from a torsed testicle, demonstrating a hyperemic rim surrounding an area of decreased activity. Scintigraphy has a sensitivity of 90% and a specificity of 60% in the diagnosis of testicular torsion. Color Doppler ultrasonography has distinct advantages in diagnosing nonvascular causes of acute scrotum. Scintigraphy may be more sensitive in the neonatal period than at other times because of the difficulty in detecting flow by means of Doppler imaging. Scrotal scintigraphy may be more sensitive than color or power Doppler imaging to the presence or absence of flow in the prepubescent testicle. An abscess, tumor, or hematoma may produce false-positive findings (rim sign). A hyperemic epididymis may be misinterpreted as a halo, producing false-positive study. Most false-negative studies are due to technical reasons or interpretative errors. Lin EP, Bhatt S, Rubens DJ, Dogra VS. Testicular torsion: twists and turns. Semin Ultrasound CT MR. 2007 Aug. 28(4):317-28. [Medline]. Watanabe Y, Nagayama M, Okumura A, Amoh Y, Suga T, Terai A. MR imaging of testicular torsion: features of testicular hemorrhagic necrosis and clinical outcomes. J Magn Reson Imaging. 2007 Jul. 26(1):100-8. [Medline]. Barth RA, Shortliffe LD. Normal pediatric testis: comparison of power Doppler and color Doppler US in the detection of blood flow. Radiology. 1997 Aug. 204(2):389-93. [Medline]. Albrecht T, Lotzof K, Hussain HK, et al. Power Doppler US of the normal prepubertal testis: does it live up to its promises?. Radiology. 1997 Apr. 203(1):227-31. [Medline]. Lee FT Jr, Winter DB, Madsen FA, et al. Conventional color Doppler velocity sonography versus color Doppler energy sonography for the diagnosis of acute experimental torsion of the spermatic cord. AJR Am J Roentgenol. 1996 Sep. 167(3):785-90. [Medline]. Patriquin HB, Yazbeck S, Trinh B, et al. 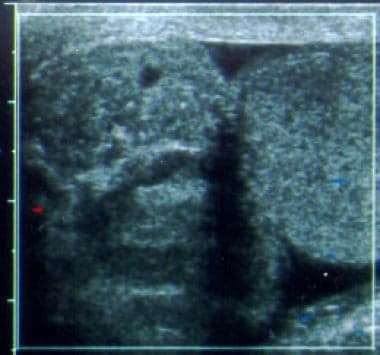 Testicular torsion in infants and children: diagnosis with Doppler sonography. Radiology. 1993 Sep. 188(3):781-5. [Medline]. D'Andrea A, Coppolino F, Cesarano E, Russo A, Cappabianca S, Genovese EA, et al. US in the assessment of acute scrotum. Crit Ultrasound J. 2013 Jul 15. 5 Suppl 1:S8. [Medline]. [Full Text]. Delaney LR, Karmazyn B. Ultrasound of the pediatric scrotum. Semin Ultrasound CT MR. 2013 Jun. 34(3):248-56. [Medline]. Coley BD, Frush DP, Babcock DS, et al. Acute testicular torsion: comparison of unenhanced and contrast- enhanced power Doppler US, color Doppler US, and radionuclide imaging. Radiology. 1996 May. 199(2):441-6. [Medline]. Guideline developed in collaboration with the American College of Radiology, Society for Pediatric Radiology, Society of Radiologists in Ultrasound. AIUM Practice Guideline for the Performance of Scrotal Ultrasound Examinations. J Ultrasound Med. 2015 Aug. 34 (8):1-5. [Medline]. Middleton WD, Siegel BA, Melson GL, et al. Acute scrotal disorders: prospective comparison of color Doppler US and testicular scintigraphy. Radiology. 1990 Oct. 177(1):177-81. [Medline]. Yuan Z, Luo Q, Chen L, et al. Clinical study of scrotum scintigraphy in 49 patients with acute scrotal pain: a comparison with ultrasonography. Ann Nucl Med. 2001 Jun. 15(3):225-9. [Medline]. Kodali SK, Abdullah ZS, Sharma P, Khan MU, Naeem M. Missed torsion in undescended testes detected by scintigraphy: testicular scintigraphy a decisive complementary tool. Clin Nucl Med. 2013 Jan. 38(1):58-9. [Medline]. Paltiel HJ, Connolly LP, Atala A, et al. Acute scrotal symptoms in boys with an indeterminate clinical presentation: comparison of color Doppler sonography and scintigraphy. Radiology. 1998 Apr. 207(1):223-31. [Medline]. Lerner RM, Mevorach RA, Hulbert WC, Rabinowitz R. Color Doppler US in the evaluation of acute scrotal disease. Radiology. 1990 Aug. 176(2):355-8. [Medline]. Trambert MA, Mattrey RF, Levine D, Berthoty DP. Subacute scrotal pain: evaluation of torsion versus epididymitis with MR imaging. Radiology. 1990 Apr. 175(1):53-6. [Medline]. Watanabe Y, Dohke M, Ohkubo K, et al. Scrotal disorders: evaluation of testicular enhancement patterns at dynamic contrast-enhanced subtraction MR imaging. Radiology. 2000 Oct. 217(1):219-27. [Medline]. Gordon LM, Stein SM, Ralls PW. 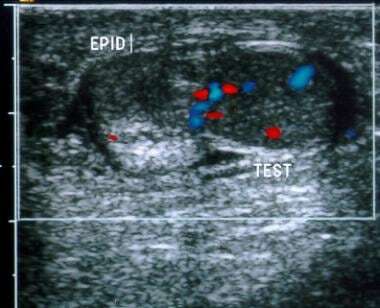 Traumatic epididymitis: evaluation with color Doppler sonography. AJR Am J Roentgenol. 1996 Jun. 166(6):1323-5. [Medline]. Horstman WG, Middleton WD, Melson GL. 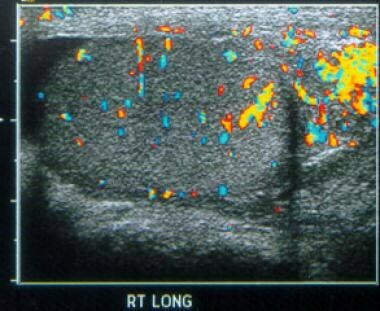 Scrotal inflammatory disease: color Doppler US findings. Radiology. 1991 Apr. 179(1):55-9. [Medline]. Bader TR, Kammerhuber F, Herneth AM. Testicular blood flow in boys as assessed at color Doppler and power Doppler sonography. Radiology. 1997 Feb. 202(2):559-64. [Medline]. Atkinson GO Jr, Patrick LE, Ball TI Jr, et al. The normal and abnormal scrotum in children: evaluation with color Doppler sonography. AJR Am J Roentgenol. 1992 Mar. 158(3):613-7. [Medline]. Luker GD, Siegel MJ. Color Doppler sonography of the scrotum in children. AJR Am J Roentgenol. 1994 Sep. 163(3):649-55. [Medline]. Luker GD, Siegel MJ. Scrotal US in pediatric patients: comparison of power and standard color Doppler US. Radiology. 1996 Feb. 198(2):381-5. [Medline]. Burks DD, Markey BJ, Burkhard TK, et al. Suspected testicular torsion and ischemia: evaluation with color Doppler sonography. Radiology. 1990 Jun. 175(3):815-21. [Medline]. Transverse power Doppler image of both testes again illustrates an enlarged, avascular left testicle.